The Mountain Resort and its Outlying Temples, Chengde, is a piece of landscape design that served as the summer resort of the Qing emperors. By the end of the 17th century the Qing emperors had established their capital at Beijing, and they began to look around for a cooler retreat. In Chengde they created a summer residence, exploiting mountains, woods and other existing natural features to which they added contrived landscapes to make settings for innumerable pavillions, palaces and temples. Outside the palace walls, to the north and west, a total of 11 temples were built. Manyof them were built in Tibetan style. Divided into eight groups, they became known as the Eight Outer Temples. The main gates of these buildings pointed towards the palace, symbolising the unity of China's various ethnic groups under the central rule of the Qing emperors. I spent two full days in this city, four hours north of Beijing by bus. Chengde itself is a nice enough encounter with Chinese city life outside the capital. No McDonalds or Starbucks can be found here. What it does have is steam trains - an internetsearch in preparation of this trip resulted in many excited stories by trainspotters. But I had my own spotting to do: the Chengde Imperial Resort as World Cultural Heritage. On my first day I explored the huge park. Don't be fooled by the somewhat standard Chinese gates and buildings at the entrance: when you've passed them you enter a lovely landscape park. There are several lakes, a steppe and a forest. 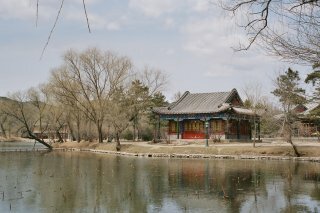 On the best "natural" spots, pavillions and temples were added. 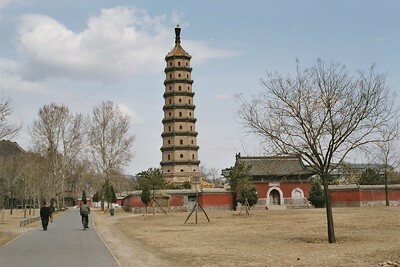 For example the tall and elegant Yongyou si Pagoda. The next day I walked to some of the outlying temples. 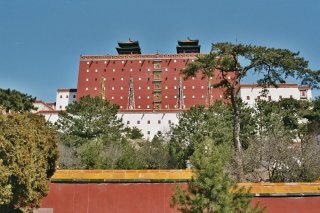 Most prominent is the Putuozongsheng, modelled after Lhasa's Potala Palace. It's a strange sight to see it here, in northern China, as well as the neighbouring Xumifushoumiao (a recreation of the Tashilhunpo monastery in Xigaze). Both are well looked after and brightly painted, but lack the atmosphere of an active buddhist monastery. hi! my name is aaron carter. i am 13 years old and i live in beijing. i went chengde for the first time in my life this year (2006). i went to chengde because our school wanted to let us see how interesting the ancient chinese really are. 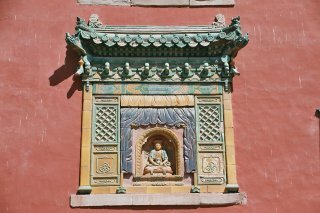 when i went to chengde i saw lots of world heritage sites including the Mountaineering Resort (sorry if thats not spelled right), the Summer Palace and still working temple. I went to Chengde on a survey trip for an update of my film on China for Disney's EPCOT Center. I wasn't able to film there for the original film ("Wonders of China") and we simply didn't have enough room to fit it into the updated film either, but that doesn't mean the locale isn't spectacular. I ran into an old man in the park who was a retired school teacher and he volunteered to be my guide. He was a wonderful source of local information and could not have been more open and friendly. I've exchanged a number of letters with him since then and hope to look him up when I return to Chengde in the autumn of 2006 for a new filming assignment. Apparently the original Qing name for this site meant “The Mountain Resort for Escaping Summer Heat”. You too might find it a pleasant escape from Beijing – it is only a few hours away by bus or train. Its main part consists of pavilions, temples, gardens, streams and lakes not that different (albeit writ very large!) from what you might have seen at the Old and New Summer palaces in Beijing – but attractive enough. It was constructed across the 18th century and consisted of 2 parts divided apparently by a “mini Great Wall” – inside were copies of 72 Chinese beauty spots and temples and a “Garden of 10000 trees”. Outside the wall (the "Outlying Temples" of the modern title) were 12 Tibetan Buddhist temples - 8 of which remain (photo). These included “reproductions” (more or less) of the Dalai Lama’s residence, the Potala and the Panchen Lama’s residence at Shigatse. However, as you wander around, you might not be aware either of the original “Political” purpose for the creation of the site nor for the possible “political” ramifications of its current restoration and elevation to UNESCO inscribed status. Was it entirely coincidental that the Potala in Lhasa was inscribed in the same year (1994)as this site? Has UNESCO allowed itself to become a pawn in China’s nationalistic policy of fully incorporating Tibet within the borders of the PRC? Indeed can “Inscription” ever be purely a “neutral” or rather a "Universal" rather than a "Nationalistic" political and cultural act? Anglo Chinese Relations: Visited in 1793 by Lord Macartney, the first British Envoy to China, in an attempt to meet the Emperor Qianlong and conclude a trade agreement. Famously Macartney refused to kowtow in front of the emperor (unlike his Dutch equivalent Isaac Titsingh in 1795!). No agreement was reached and in a polite letter to George III the Emperor stated that "we possess all things. I set no value on objects strange or ingenious, and have no use for your country's manufactures." Hunting Lodge or Castle: "used to be a summer resort and hunting ground for emperors of the Qing Dynasty (1644-1911)"
Tibetan Buddhism: See page 8 of link: "the revival of Tibetan Buddhism in the frontier brought an isolated lama organization, which cannot express the feudal structure in the minzu area, the red cowl of the lamas and the sound of reading classics from the temple were only some sad symbol of the history." 83 Community Members have visited.